Isabelle Daza shares ways on how to find a group at a party. Isabelle Daza is not only known for her great speeches at her friends' weddings but also for her sense of humor. 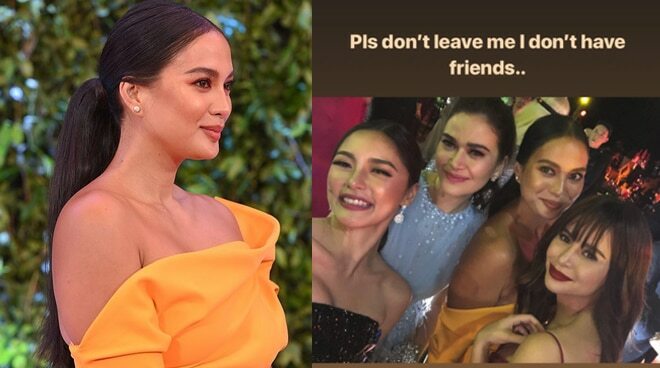 The actress recently attended the ABS-CBN Ball and she amusingly documented her experience on how she struggled to find a group of people to hang out with at the event. In one of her Instagram Stories, she wrote, "I'm just looking for a group that I can enter and make small talk with." She found a group at the ball and happily bonded with Alex Gonzaga, Bela Padilla, Kim Chiu, Yassi Pressman and Melai Cantiveros. "Please don't leave me, I don't have friends," she posted in another Instagram Story. However, her first clique at the Ball became busy taking photos. "Okay they left to take pics... How do I make my way without being epal?," she posted in another Instagram Story. In another post, the actress attempted to join the group of Luis Manzano, Jessy Mendiola, Alex Gonzaga and Mikee Morada. "Now waiting for the perfect time to enter the conversation," she posted.